Copyright © Janine Zend, 1981, all rights reserved, reproduced under license. 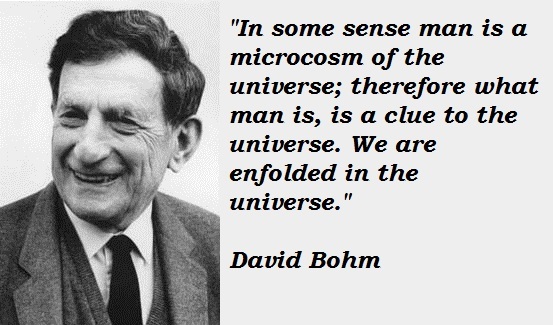 These hitherto unpublished poems were inspired by theoretical physicist David Bohm, whom Zend knew personally through his work at CBC Ideas. but they are just mine, they are not me. and ask him how to break out of his misery. and dig below your little bed." full of gold and diamonds. but he hadn't been aware of it. I am the center of all things. The first problem: How large is outer space? but doesn’t understand this word. Finite? Then what is beyond it? how far can it be divided? Infinitely? How far is that? Or is there an indivisible building block? what would it contain? Would it be empty? The cosmos cannot be empty! So what would it be full of? The third problem: How long is time? what preceeded it and what will follow it? then how is it possible? inextinguishable thirst to understand it? and even less, how we should live for what we live for. If God dwells outside the world, then where is that? And if that's no longer part of the world, then what is it? then what’s the difference between God and this world? created by an everlasting being? we wouldn't have needed to create a Creator! He planned everything out, then why do we strive? If He expects us to be good, then why does He allow Evil to proliferate? If He lets us chose freely, then He is superfluous. built solely for the purpose of getting lost in. dying is bad, then living is bad because dying is inevitable. But if living is bad, then dying is good. And if dying is good, then living is good too. we have to chose, and is there any way out? then what would the problems he in a life after death? How is it possible to bear a life without problems forever? then why should we even start it? a life equally unbearable because of its problems? that nothing is better than this something. although in the real world there are only presences. to pay the telephone bill tomorrow? and the fifth, for sexual stuff. serve for getting hold of the Input. serve for getting rid of the Output. the Mind is a mystery. that it doesn't understand the world. The Mind is a question without an answer. The World is an answer without a question. The Mind is the "why?" The World is the "just because." whose poem does not rhyme. and therefore I shall die. and make rhythm, rhyme, sense?